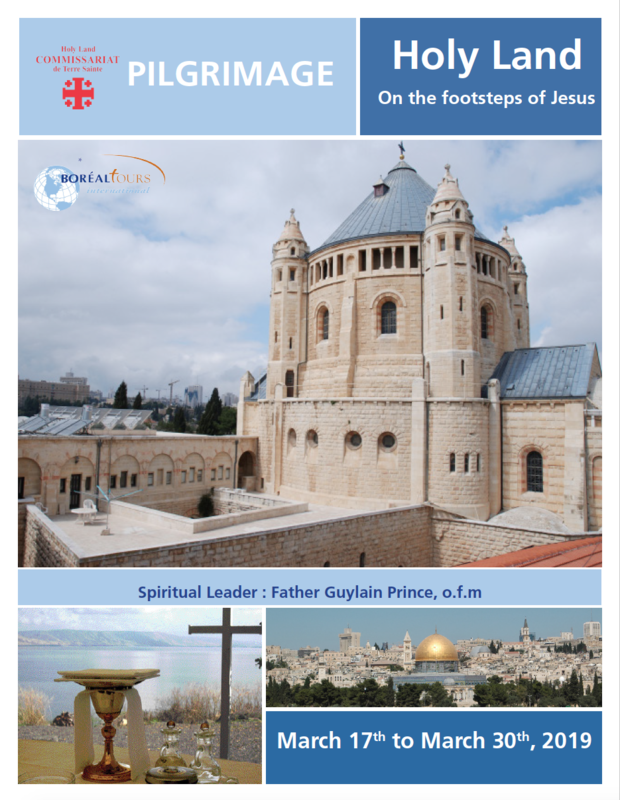 This official pilgrimage of the Commissariat of the Holy Land of Canada is rooted in its mission: to make known and to love the land of the revelation of the God of Abraham. It combines the spiritual animation and the biblical expertise of Franciscan P. Guylain Prince. This pilgrimage is accompanied by a English speaking Israeli tour guide from the Boréal Tours agency. Listen to the words of the Bible, on the land that gave birth to it. Experience the desert, a place of silence where speech was given. Visit the narrow streets of Nazareth where the voice of the Angel offered his words. Sailing on the waves of the Sea of Galilee to the sermons proclaimed by Jesus on a mountain. From the magnificent summits of Thabor where one embraces Galilee to the vivid memories of the footsteps of St. Francis. Experience unforgettable Jerusalem, a city three times holy, with the Mount of Olives , Mount of Zion and the empty tomb near Golgotha. A pilgrimage focused on listening, with a bible in hand to discover the landscapes, the oldest traditions, and the history that forged the origins of Christianity.